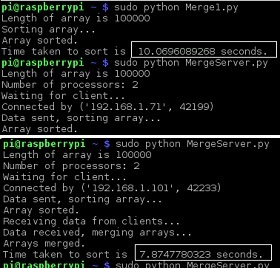 Distributed computing technology breaks a problem into parallel tasks running on two or more computers. 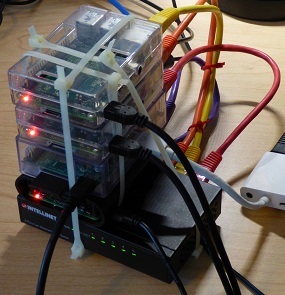 With the convergence of low-cost processors and high speed networks, computer clusters have emerged as an affordable solution to do-it-yourself high-availability. 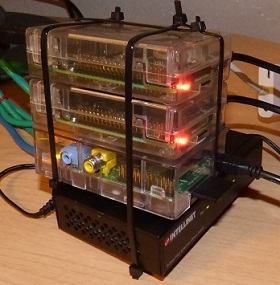 In this experiment, multiple miniature computers are connected to perform distributed computing. The Raspberry Pi Organization (raspberrypi.org) offers a pocket-sized single-board computer for approximately $35 USD. 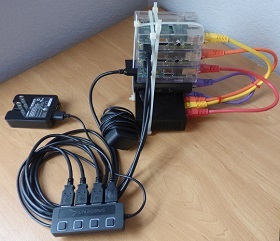 Several versions of the free Linux operating system are available for the Raspberry Pi. 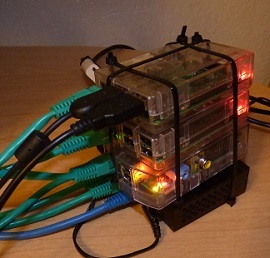 The mini Linux (Raspbian/Debian) computer group is further compacted by latching the computers together. 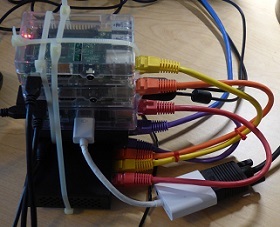 Another Raspberry Pi is added to the computer group. Each computer has a colored cable (yellow, orange, red, purple). For each computer, static IP addresses are assigned. Make note of the inet addr, bcast, and mask. Make note of the gateway address. Interfaces file can be updated to set static information with nano. Ctrl+X, then Y to save.